There’s a website I recently discovered that is sure to be of interest for Steampunks looking to outfit their abodes with a Victorian flair. The Victorian Trading Company has all manner of goods inspired by Victoiriana. The Victorian Trading Co was started in 1987 by Melissa and Randy Rolston in Dallas, Texas and now operates as a small company based out of Lenexa, Kansas outside of Kansas City. From antique reproductions and fashion to outdoor living and accessories, The Victorian Trading Company is a great resource for finding items to match your Steampunk decor. They even have free e-cards for you Steampunks wanting to send a message to your equally steamy friends. You can check them out here. After what has been an apparently miserable April in Seattle, Spring is (more or less) here, and with it comes shorter hemlines and that irresistible draw to the outdoors. Being well dressed but simultaneously well prepared for adventures can be something of a challenge for the Steampunk who wants to flaunt their steamy sensibilities and remain unburdened by cumbersome layers or a hefty dry cleaning bill. Fortunately, Wondermark has your answer in the form of a new Steampunk t-shirt, The Steam Powered Heart. The Steam Powered Heart T-Shirt comes in both mens and womens cuts and is one item in a very nice line of shirts, prints, and books created by Wondermark. Click here to see the full offering of goodies for sale by Wondermark at TopatoCo. If you find yourself enjoying the humor and wit of Wondermark, do be sure to drop by their main website for a multitude of entertaining comics for your reading pleasure. I always seem to hear a lot about Steampunk ladies needing help getting into their corsets at Steampunk events. When I ask them why they need help and inform them I’ve been putting corsets on by myself since the moment I started wearing them, they stare at me as if I am insane. How is it that I am able to put on a corset by myself, they demand. Isn’t that physically impossible? Ladies, I’m here to tell you it is not impossible to put on a corset by yourself, given a little practice and a correctly laced corset. The fact of the matter is that most women had to put on their corsets by themselves because the majority of them did not have servants to assist them. The corset was a fundamental undergarment that nearly woman of every social class wore during the Victorian era. Given that, and the fact that not every woman of every social class had a servant, that leaves a lot of women in our past unable to dress themselves every day, right? Wrong. They figured it out, and rest assured, we can as well. Allow me to direct your attention to a useful tutorial How To Put On A Corset… By Yourself by Corsets and Crinolines, a website dedicated to vintage fashion. This tutorial takes you step by step through the same method I use in putting on my corset. Though it requires some patience, putting on a corset by yourself can be done. If you’re still finding it difficult to put on a corset by yourself after patiently following the directions linked above, it is highly likely you have an improperly laced corset (or fused elbow joints). Please view this lacing tutorial from Wasp Creations which will show you instructions in photographs for lacing a corset. If your corset is not laced in this manner, you will find it incredibly difficult to ensure the laces of your corset are properly and evenly tightened in general, and especially if you are attempting to put on the corset by yourself. I hope this has helped a few of you become more independent in your corset wearing activities. Enjoy the new found freedom in being able to dress yourself in your Steampunk gear! I’m always on a quest to find the unusual for my Steampunk wardrobe. It’s a careful assembly of handmade pieces acquired through my own creative efforts and the diligent searching through the internet’s vast selection of incredibly talented Steampunk artists. With the knowledge that there was going to be a cotillion at SteamCon II this year, I set off on a mission the acquire a formal gown for the dance. But not just any gown! This had to be something very special. Something one of a kind. And after months of searching for that perfect gown, I found it through Etsy on Kimmi Designs, and when I received it in the mail, it exceeded my expectations. Kimmi’s talent for design was undeniable, and while she’s not an explicitly Steampunk designer, her designs have such a delicate retro feel to them that they are sure to appeal to Steampunks and Dieselpunks alike trying to work a bit of the antique into their wardrobe. Her work is especially outstanding because most of her work is done from recycled and repurposed cloth. Kimmi was kind enough to recently grace me with an interview, where we chatted about her designs and inspiration. How did you get into fashion design? How long have you been designing? I got into fashion design from early on, my grandmother taught me to sew, I was always wanting to make new outfits and costumes as a kid. Have you always had the green aspect to your designs? How did you decide to commit to this practice? I’ve pretty much always been drawn to older fabrics, their history, textures. As my business progressed I realized the uniqueness of recycled fabrics was even more of a plus, being able to create more one-of-a-kind designs is more appealing to me as a designer. Even if I’m using a pattern/design over and over again, the fact the fabric is different each time makes it unique. What inspired you to produce clothing from recycled materials? I’ve worked for companies doing mass production and it was tedious and pretty much mind numbing. And after seeing the piles and Piles! of used textiles I realized there’s already enough fabric out there, no need to create more textiles to make clothing, too much waste! Do you find it difficult or limiting by using recycled materials? Under what circumstances do you use new materials? I do use new fabrics, on occasion for custom orders if the customer requests it. And every once in awhile a new print just blows me away and I have to have it! What are some of your favorite textiles to work with? Why? My favorite textile to work with is lace! I absolutely Love the variety of patterns, the different fabric contents it can come in; cottons, silk, rayons, poly, blends. All so different in the draping or crispness. The patterns are what speak to me, telling me how they should lay on the body. How would you classify the style of your creations? What fashion genre do your clothes best fit into and why? I really don’t know how to classify my designs. Some of them, I realize, have a very vintage feel, but they always have a modern twist. So I hesitate to put my designs into a specific category. For the first three photos, photography by David Miller and the models are Marissa and Aly. In the second two photos, the photography is by Vincent Lopez, and the models are Elle Von Sonnet and Samantha. All hats were created and designed by Boring Sydney. Tom Banwell’s masks are some of the most recognizable and unique Steampunk masks out there right now. With Halloween approaching fast, there is a pressing necessity for something unique and standout from the crowds of cheap, pre-assembled costumes. I do believe I recognize one of his pieces from the Steampunk art exhibition at the Museums of the History of Science in Oxford, England. Mr. Banwell runs a blog wherein he talks about his unique masterpieces. You can check it out here. His pieces are for sale on Etsy. I have no formal art training, and am largely self taught. I have dabbled in a variety of media over the years, including batik, woodcarving, mixed media art dolls and leatherworking. Creating art in a steampunk genre suits me exceedingly well because it combines several of my interests—history, costuming, mechanics and fantasy—and I can bring these together and get wildly creative in my leatherwork. As a child I was fascinated with helmets and other hats, and I collected them. As an adult I’ve had a business designing and making men’s Western leather hats that sold throughout the United States. My current business is casting custom resin pieces, and much of that work consists of imitating other materials: bronze, marble, wood, etc. In my creative leatherwork I draw on this experience and incorporate resin components into my artwork. Today I find my greatest creative expression in fantasy masks and helmets. I love experimenting and seeing how leather will behave when cut and soaked and twisted. I love the shapes and the colors, and how my masks and helmets can instantly transform the wearer into a whole other character. My studio is in the little town of Rough and Ready, in the foothills of the Sierra Nevada mountains in northern California. So, if you’re looking for the perfect mask to go with that Steampunk ensemble you are assembling for Halloween, or just looking for the finishing to touches to your Steam driven wardrobe, you won’t fun much more unique or quality work with Mr. Banwell’s works of wearable art. Recently, I was asked by some very good friends for some tips on Steampunk Fashion. Corsets tend to dominate the feminine Steampunk look, and my friends were looking for a few alternatives to squeezing into a corset. While a corset does wonders to define the female figure, there are some people who do not wish to wear one or have medical concerns that complicate the wearing of a corset. But does this mean that said lady must give up her Steampunk wardrobe? I did some research and I’m very happy to report back some of my findings for their, and your, enlightenment. I’ll be providing photos and lots of clicky-links for inspiration. Just as a reminder, though, all of these suggestions will look much more Steampunk with a collection of accessories. Though you are leaving your corset behind, don’t forget about important additions to your ensemble that are critical to completing your Steampunk look! Here’s a photo of me in my Steampunk Jumper. I like this style of dress because it is flexible, casual, and lightweight, perfect for the sweltering Texas summers. I’m not wearing a corset with this dress, or stockings, or a bustle, making me a far cry from a proper Victorian woman (lulz) but definitely a good example of a comfortable Steampunk. The dress has been tailored to be form-fitting in the bodice, so it has a flattering look without the use of a corset. Some other examples of this type of dress can be found here, here, and here. Waistcoats are also another solid option when aiming to replace the corset in one’s wardrobe. They are versatile, can be worn with any bottom garment and with or without a blouse to achieve different looks. You can see other examples of Steampunk waistcoats for women here and here. Why bother with any more than a simple blouse when you can wear an impressive frock coat that is sure to make a statement? Coats are nice because, if properly selected, can single-handedly redefine your look simply by slipping it on and off. Unfortunately, coats are not a staple fashion accessory in Dallas, but they are still worth looking at as a way to replace the corset and still look Steampunk. There’s lots of options out there aside from the one listed above, that you can see here, here, and here. I really love the last example because the coat (which has a matching skirt that is sold separately) is just “professional” enough for me to get away with wearing it to work. Needless to say, it’s high on my list of things to purchase soon. You could even wear a jacket as a top by itself, like this riding habit from the Victoria and Albert museum. This is, admittedly one option that I really like but have not seen done too often. An apron can transform your look significantly based on the sort of apron one chooses to don. The one above reminds me of a scientist or engineer. A leather apron can also work wonders for the Steampunk wardrobe. 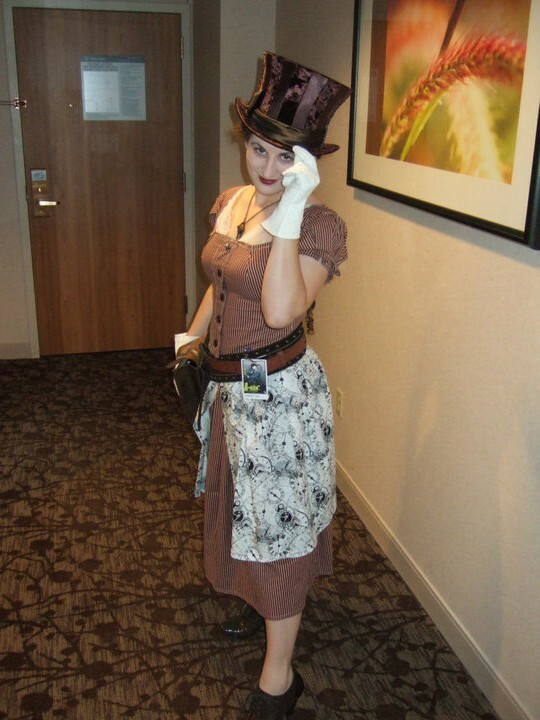 Here’s another similar example of a Steampunk Apron from the Steampunk Fashion Live Journal community. So, the verdict is… yes, you can most certainly go without a corset and still achieve a very Steampunk look! It’s all about using a bit of creativity to complete an ensemble that represents and expresses you. Who is eligible: Anyone who wishes to submit a t-shirt design. Deadline: Submissions must be emailed to t-shirtcontest@steamcon.org by September 1st. Design specs: Full color, Size: anywhere from 8″ x 8″ up to 8.5″ x 11″. Initial submissions should be jpegs of 100 DPI. The final art will need to be Photoshop files with the layers or bitmaps or tiff or comparable; at 300 DPI. We will request those of the winner after judging takes place. The shirt should say “Steamcon II” in roman numerals and a serif font. Any other text is optional, but it can have the date and “Weird, Weird West” as well. Designs will be printed on a dark colored t-shirt either black or dark brown, so take this in to account when designing. If you have any questions, email info@steamcon.org. A membership and a pair of tickets to the Saturday night concert (which, for all of you who haven’t been on this SteamCon site, happens to be Abney Park)?! *shakes fist* Why can’t I draw!? While I already have my membership in tow, I certianly wouldn’t complain about having tickets to the Abney Park concert before they go on sale to anyone else. No, I don’t anticipate I would have a problem with that at all. So, for all you artists out there, go ahead and submit a design for their consideration. Best of luck! And just so that you all know, I was halfway through a Microsoft paint project to show you all just how bad my t-shirt design would be, before I decided to spare you all the horror and me the humiliation. It involved a stick figure cowboy with a swollen gland on the side of his face very reminiscent of John McCain, and a terrible attempt at gear, that ended up looking more like a sun. So, yeah.